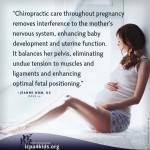 Chiropractic and prenatal care for expecting mothers? Dr. James Lee from Austin Chiropractic has been working with pregnant woman and newborns for over 15 years. Chiropractic care in prenatal stages is great to establish pelvic balance and proper alignment of the spine. Chiropractic care will also reduce the discomfort of the mother and child and create the best position for delivery. Whenever the pelvis is out of alignment the child’s body will move around and seek a less optimal positioning to avoid the pain. Dr. James Lee from Austin Chiropractic has been trained at Life Chiropractic College on Pediatric Chiropractic. The International Chiropractic Pediatric Association recommends that women receive chiropractic care throughout pregnancy in order to establish pelvic balance and stability. After the child is born, continuing with Chiropractic care will help the mother’s body return to her regular biomechanics sooner. The pregnancy and the delivery of a newborn have the potential to create a lot of added stress and tension on the mother’s body. This stress and tension left unchecked will accumulate and accelerate afterwards when more lifting and carrying is required. Chiropractic care as well as stretching and strengthening exercises will return the mother to her pre-pregnant form significantly faster. Breastfeeding, holding the newborn, carrying for long periods of time, carrying car seats will aggravate the mid back area. This added to sleepless nights will also increase the stress and tension in the body. Dr. James Lee recommends Chiropractic care for all pregnant females and newborns, it is safe and an incredible investment in your health.